Common Dots is a program that has a decent-looking official website commondots.info. Even though it is promoted on this website, you will not find any information about the program on it. In addition, you will notice very soon that it is impossible to download this program from it. If the application is reliable, it always explains how it is going to act, so it does not seem that Common Dots is a trustworthy program. Actually, specialists working at pcthreat.com say that this program is a typical advertising-supported application. In other words, it simply shows commercial advertisements on a user’s screen. We do not think that it is worth keeping a completely useless program installed, especially when there is a huge possibility that it will cause serious harm to your PC. You will be able to erase Common Dots easily after reading this article. Positive Finds, Assist Point, Dragon Branch, and On Stage are programs that act in the same way as Common Dots. If you have ever encountered any of them, you will definitely agree with us that it is necessary to get rid of Common Dots too. If you do not do that, it is very likely that you will click on the advertisement generated by this adware and end up on some kind of corrupted website. Specialists have noticed that adware based on the Injekt engine provide users with relevant advertisements in order to lure them into clicking on them. In order to generate such interesting ads, programs record details about a user’s online behavior: search queries, the websites he/she visits, the time he/she spends surfing on those websites, the content he/she accesses on them, and much more. If you do not want to reveal these details, you should remove Common Dots entirely. 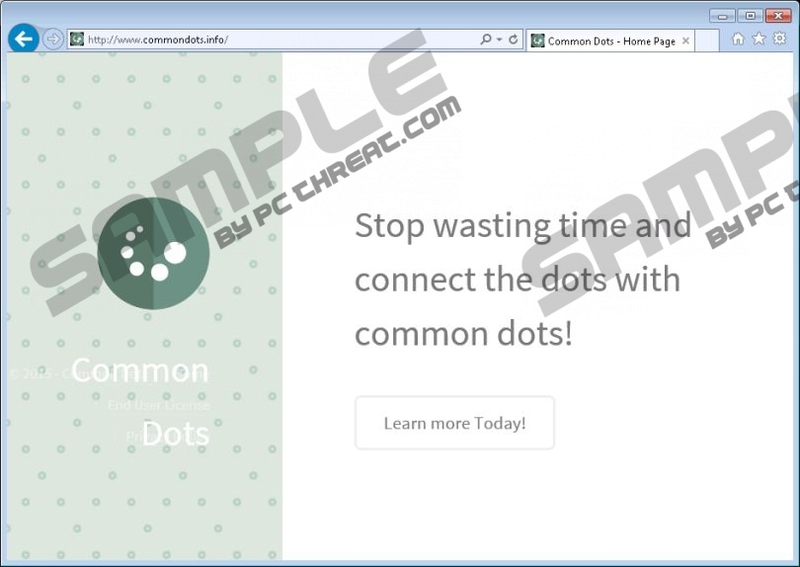 Unfortunately, there are hundreds of adware similar to Common Dots and they might enter your system. Thus, we highly recommend that you acquire an antimalware tool, install it on the system, and keep it enabled. It is also very important that you do not visit and download programs from untrustworthy websites. Finally, double-check whether the program is really trustworthy prior to the installation. As can be seen, you should not do much in order to protect your system from malware. Luckily, adware based on the Injekt engine can be erased rather easily. In fact, it is enough to remove them via Control Panel. You can use our manual removal instructions for this matter. Another way to delete this program is to scan the system with an antimalware scanner. There are hundreds of scanners available, but we recommend using SpyHunter because we know that it will not disappoint you. In addition, it will not allow malware to enter your system as long as you keep it enabled. Right-click on the suspicious application and click Uninstall. Quick & tested solution for Common Dots removal.